Biennials or short-lived perennials, 10-45 cm; fibrous-rooted, caudices simple. Stems ascending (usually reddish proximally, branched distally), strigose, rarely hirsute proximally, eglandular. Leaves basal (commonly persistent) and cauline; basal blades oblanceolate to obovate or spatulate, 20-100(-130) × 4-20 mm, margins serrate or crenate to pinnately lobed, faces sparsely hirsute to strigoso-hirsute (hairs ascending), eglandular; cauline becoming narrower and entire (bases not clasping or subclasping), abruptly reduced near midstem. Heads (1-)3-20(-60) in loosely corymbiform arrays (usually from branches beyond midstem). Involucres (2-)2.5-4 × 5-10 mm. Phyllaries in 2-4 series, sparsely strigose, eglandular. Ray florets 60-120; corollas blue to pale lavender or white, drying blue to purplish, 3-5 mm, laminae not coiling or reflexing. Disc corollas 2-2.7 mm. Cypselae 1-1.2 mm, 2(-4)-nerved, faces sparsely strigose; pappi: outer of setae, inner of 11-15 bristles. Flowering mid Mar-May(-Jun, -Nov). Open oak, oak-pine, or pine woodlands, roadsides, fencerows, pastures, bottomland, sand or sandy clay, less common in clay; 10-200 m; Ala., Ark., Fla., Kans., La., Miss., Mo., Okla., Tex. 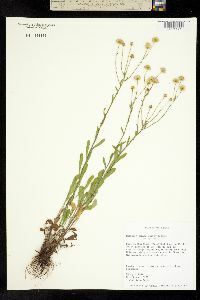 A plant reported as Erigeron tenuis disjunct in North Carolina is perhaps better identified as E. strigosus: pappus bristles on the ray cypselae are reduced and variable in number.